1605 to 1615 UT3LL RO/O -15dB best on JT65c... Valery has a 3.2m dish and approx 100W. 1631 to 1640 RW3BP O/RO and -15/14dB on JT65c. During these QSO's I had almost 50% blockage and my noise floor was up 6dB from local buildings and trees. 1554 to 1620 UT3LL O/RO and -25/-17dB on JT65c. 1916 to 1941 UT3LL O/RO and -20/-13dB on JT65c. 1950 to 2009 RD3DA O/RO and -28/-23dB on JT65c... Yri has a 2m dish and 35W, horizon only. 1828 to 1850 Sked with 4O6EME (special call for YU6 - Montenegro) completed, -24dB best on JT65b for DXCC and Initial DIG# 12. 1941 to 1947 OK1DFC RO/O -8dB best on JT65c. 2047 to 2057 UT3LL O/RO -18dB best on JT65c. 1626 to 1634 4O6EME (random) RO/O and -22/-25dB on JT65c... Bodo was calling CQ, and I copied every over from him both before and during our QSO. Conditions were very good, and he peaked at -22dB, amazing! 1810 to 1819 G4RGK O/RO and -18/-15dB on JT65c. 1821 to 1829 UT3LL O/RO and -19/-16dB on JT65c. 1916 to 1927 UT3LL RO/O -17dB best on JT65c. 2001 to 2008 G4RGK O/RO -19dB best on JT65c. 2215 ES5PC 569/579, 2033 SM5LE 559/559, 2053 N2UO 569/559, 0008 W7UPF 559/559, 0019 K5PJR 559/579, 0038 WA4OFS 559/449, 0216 WB2BYP O/RO for Initial CW# 236, 0229 WW2R 559/559. 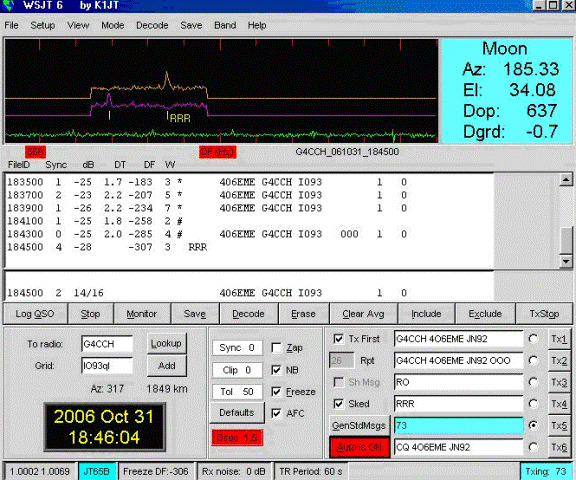 0240 to 0246 Partial with RD3DA... Yri was -28, with the Moon only 1 deg above his horizon. The Moon set at his end before we could complete. 1830 to 1838 9A/DL3OCH (random) -21dB best on JT65c, for DXCC (Croatia) and Initial DIG# 13. 0116 to 0124 PA0BAT RO/O -15dB best. 2036 SM5LE 559/559 and 2042 IW2FZR 569/579. 2130 to 2140 Test with G4DDK NIL... Sam had a problem with his RX LNA. 2140 to 2247 Test with GM3SBC NIL/-20dB best on JT65c... This was Ed's first signal on 23cm EME, has a 1.8m dish and a patch feed, and should be making QSO's soon. 2045 to 2100 SM7GVF O/RO and -25/-25dB on JT65c for Initial DIG# 14... This was Kjells first 23cm EME QSO with 1 x 67 el WIMO yagi, 60W at the feedpoint, and a RX nf of approx 2dB with his LNA in the shack. 1852 to 2022 VK7MO R-25/-26dB initially in a long test almost to the limit of Rex's window. At the start of the test, my dish was almost completely obstructed by a silver birch tree, but Rex's signal was easily detected after a few overs and improved as the Moon rose clear of the tree. I was also detected during my test with VK7MO by Denis G3UVR with a 23el yagi using Spectran... no decodes yet as he was using an old version of WSJT, but we will be testing again soon. 2104 to 2152 VK7MO long test initially R-28/-29, but improved to -15/-14 as my dish started to clear the wet beech tree that obstructs my Moonrise. As usual, the ARRL EME contest brought out the biggest activity of the year. I was active predominantly on CW, which is my favorite mode, and also on JT65c. Operation was UNASSISTED - no self spotting, use of DX clusters, loggers, chats, or other forms of communication during my operating periods in the Contest. However, as I did log on to and use HB9DRI's 23cm low power activity logger AFTER my session on 15th October but while the Contest was still in progress, and did tests with VA7MM and WW2R (both of which I had already worked on CW), then I will be entering in the ASSISTED class to ensure that my entry was within the relevant rules. Unfortunately, my memory keyer gave up after 20+ yrs use, so I had to send all CQ's etc by hand... I'm currently looking at possible solutions, but I'm not giving up CW! There was plenty of CW activity, and at times the bottom 25 KHz of 23cm sounded like the 20m CW segment, with several strong signals some peaking over S9! 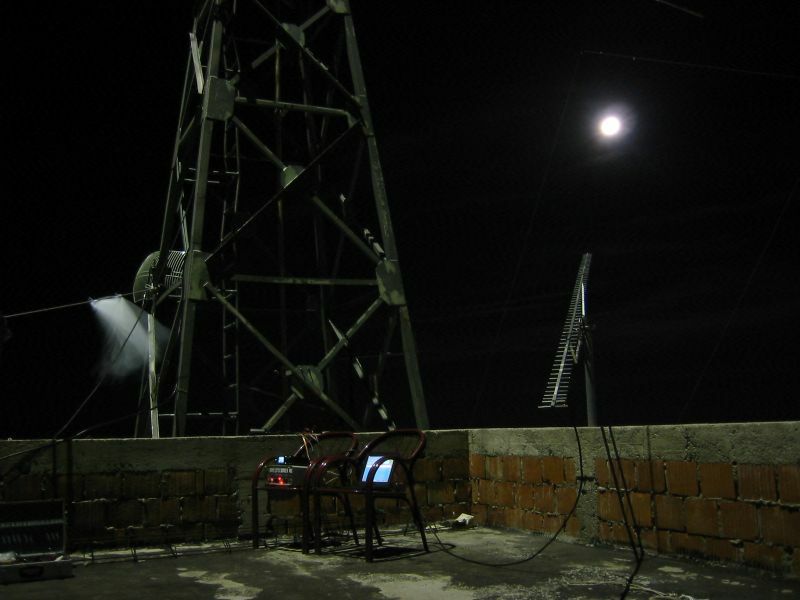 It was often difficult to find a clear frequency, or avoid others landing close by which made it difficult to hear any weak signals who replied. Activity was more spread out than previously, but I still found that calling outside the busy part of the band generally yielded a lower response rate, as many did not tune up that far. I called CQ on JT65c a few times near Moonrise and Moonset, but as expected, the response rate was very low... and maybe not worth "thrashing" my PA for. But I did make 7 QSO's, most of which I would have had trouble completing on CW. I had a few hrs sleep during just before the US window started on both nights, but I was still very tired and copying weak CW towards the end of the contest was proving too much for me. Afterwards, I found out that PA3DZL was one of those that was just too weak (normally easy copy), but I'm sure there were a few more. The only call that I heard, but never worked was WB2BYP, and I don't think I called anyone who I didn't complete with. During the contest I made 83 CW/SSB and 7 JT65c, and found 39 multipliers. Multipliers were down on last year. Missing were: CT1, GM, USA - IL (W9IIX), USA-MI (W2UHI) and VE-NB (VE9DW). Fortunately, there a a few extras to redress the balance: EA, USA-AK (KL6M) and USA-VA (NA4N). I also managed to pick up a couple of initials with ON4BCB on CW and PA3FXB on JT65c, which improved my standings to 237 x CW Initials and 15 x Digital Initials. Many thanks to all who operated during the contest, and especially those that I had a QSO with... you made it great fun, without activity there would be no contest. 2030 IW2FZR 559/569, responded in CW to my JT65c CQ.